Last month, we wrote about some of the more ridiculous subsidies that Hollywood studios get these days, in which approximately $1.5 billion in taxpayer money goes straight to Hollywood studios in the US (and even more internationally). While the reasoning given for most of these programs is that they create jobs, a thorough study of the various programs showed that almost never happens. Of course, most of those programs have been state subsidies. 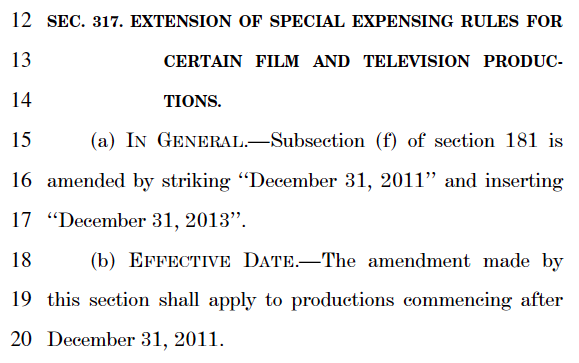 The federal government also has its own subsidies for Hollywood -- and they just got renewed in the fiscal cliff deal, despite being scheduled to expire. The original tax incentive applied to productions costing less than $15 million to make ($20 million in low-income areas). The 2008 extension applies to all films, up to a deduction of $15 million (or $20 million in low-income areas). The incentive is especially generous to television series; it applies to each TV episode. Apparently, this sucker costs the American taxpayer about $150 million per year. As that link notes, "Disney's Gotta Eat." Yes, this was just one of many such "pork" efforts slipped into the fiscal cliff deal -- along with things like providing Goldman Sachs subsidies for its headquarters, special breaks for NASCAR, tax benefits for Puerto Rican Rum, and more -- so perhaps it's not that surprising. But, it's stories like this that explain why so few people trust Congress, and why they're fed up with "crony capitalism." True, but we GOTTA do something. We can't survive, as a country, if this crap continues, you know it and I know it.